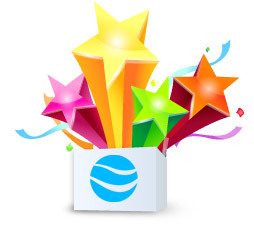 • Downloads online movies from all video websites and video-sharing sites. •	Captures anything playing on the PC. •	Converts the downloaded/captured videos to various video/audio formats. •	Plays back the downloaded/captured videos directly with the built-in video player. 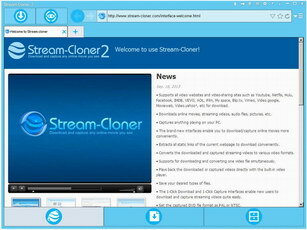 Stream-Cloner 2 is an all-in-one leading stream downloader to download favorite online movies, streaming videos, audio files, pictures, etc. Downloads multiple streaming videos at one time with high speed. The 1-Click Download interface enables new users to download streaming videos quite easily. Intelligently analyzes the source video URL. Select whether to always download the video with the maximum size after analysis. Select whether to pop up the submission window when adding a download task from the URL filter. Add a URL filter manually to only save your desired types of files. Select whether to add a URL manually to analyze and download videos or enter the main interface to download videos with the internal browser when Stream-Cloner starts. Supports for downloading online TV shows from social video websites. Downloads streaming videos from all HTTP protocols. Freely customizes the capture frame. Set the captured DVD file format as PAL or NTSC. Converts the downloaded and captured streaming video/audio to various video formats such as AVI, MKV, MP4, MOV, 3GP, ASF, WMV, MPG, TS, VOB, FLV, SWF and audio formats such as MP3, MP2, AC3, OGG, AAC, M4A, WMA, WAV, AIFF, AU, etc for enjoying on popular media devices. Converts multiple video files simultaneously. Browses your finished tasks by listing the reports or icons. Quickly opens the folder where your downloaded/captured videos are saved. Shows the detailed task properties such as title, description, source URL, screenshot, creation time, etc. Quickly runs the program anytime by right-clicking on the webpage where your fancy video is played back as long as you have selected "Add items to the Internet Explorer menu" when installing Stream-Cloner. Set the maximum analysis duration time.